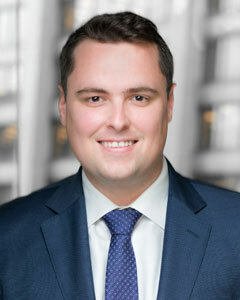 Kenneth C. Hoffmann is an associate attorney at Brennan Burtker LLC. He concentrates his practice in professional liability, product liability and construction negligence. Mr. Hoffmann has dedicated his practice to defending hospital networks, physicians, nurses and other healthcare providers in complex medical malpractice cases from inception of the case through trial. He also has experience representing product manufacturers and construction companies. Mr. Hoffmann is a graduate of the University of Illinois at Urbana-Champaign where he majored in Economics. At the University of Illinois, Mr. Hoffmann had the privilege of being a Chick Evans Scholar. He formerly served as a board member with the Evans Scholar Young Alumni Association. He received his law degree from DePaul University College of Law.